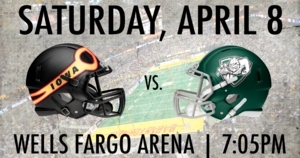 DES MOINES – The Iowa Barnstormers return to Wells Fargo Arena to face the Green Bay Blizzard on Saturday, April 8. Kickoff is set for 7:05 p.m. CDT. The Iowa Barnstormers will face the Green Bay Blizzard in their second of four matchups this season. The Barnstormers currently lead the series, earning a victory in the first meeting between the two teams. The Iowa Barnstormers official dance team, the Storm Chasers, will be hosting a Youth Dance Clinic pre-game at Wells Fargo Arena on Saturday. The Junior Storm Chasers Dance Clinic, open to girls ages 5-12, will take place on the Barnstormers field at Wells Fargo Arena from 10:00am-1:00pm. Participants will learn choreography from Storm Chasers Dance Team Coach Jen Nason that they will later perform with the Storm Chasers at halftime during the game. Pre-registration is now open for $40, with the registration fee increasing to $50 the day of the event. Registration includes a t-shirt, ticket to the game, snack, and Storm Chasers Dance Team poster. Saturday's game will feature a hat giveaway courtesy of Scrap Processors, Inc. The first 1,000 fans at the game will receive a free hat. The WWE belt will also be making an appearance at the game. Fans will have the opportunity to take a photo with the belt on the main concourse behind Section 124 throughout the game. Tickets for the Iowa Barnstormers vs. Green Bay Blizzard game are on-sale now by calling the Iowa Barnstormers front office at (515) 633-2255 or visiting www.theiowabarnstormers.com.